In today’s world, where computers have become as ubiquitous as televisions, Information Technology plays a critical role in an organization. 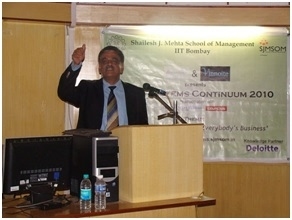 Systems Continuum explores different aspects of Information Technology and Information Systems in business by initiating discussions on cutting-edge topics. Each Systems Continuum consists of a series of events centred on a particular theme. Eminent speakers from industry and students of management and engineering institutes converge for an entire day’s event consisting of a lecture series followed by a panel discussion. 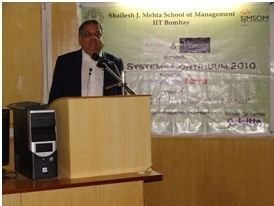 Information Technology plays a critical role in an organization. The changing socio economic and business landscape coupled with technological evolution and penetration, the disruptive effect of it, for the benefit of everyone, is omnipresent. It has forced new thinking and approaches to modern businesses and fostered revolutions in global economy and profoundly impacted the lives of people. "Evolving Role of IT - IT's Everybody's Business"
Social Media Networks – What do they mean for business? In case you feel interested to listen to top people in industry, wait till to read below. 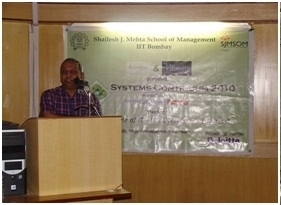 $ystem@tics, with our knowledge partner Deloitte, presented a nation wide case study competition as a pre-event to the Systems Continuum 2010. For Details and participation, click here. 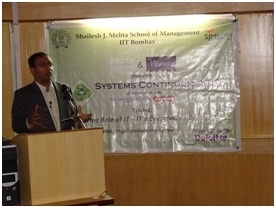 The Systems continuum, in association with knowledge partner "Deloitte", discussed the theme: "Evolving role of IT - It's everybody’s Business" on 25th September 2010. The event was flagged off by Dr. Karuna Jain, Head of the Department, SJMSOM and Ms. Kirthiga Reddy, Director – online operations, Facebook India. Dr. Jain, in her inaugural address mentioned the role of information and communications technology in transforming the world. Ms. Kirthiga Reddy talked about the Disruptive Impact of Social Web at both personal and business levels as face book believes “Social Changes Everything”. On one hand she discussed how “Pepsi is choosing projects for research funding from voting on Facebook and touching many lives and on the other hand, Facebook is affecting different verticals like Gaming, Entertainment, E-Commerce, B2B etc Also talking about the journey of Facebook, she said the organization was aligned to its mission of “Give people the power to share and make the world more open and connected”. The applications like source translation tool, tagging of photos, personalized newspapers etc are all in line with its mission. 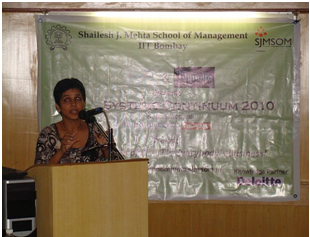 Discussing the key trends, she shared how social has brought the new age of two way communication. All in all it was a very invigorating session where the audience was completely hooked to their seats as they could all relate to very easily. Mr. Milind Padalkar, SVP and Head Oracle Universe, HCL Technologies engaged the audience with his insights on aligning IT with business revolution in 2010. He enlightened the audience regarding the effects of asset management, information overload, sectional imbalances, disruptive ecosystem and organizational transformation in the success of a business. Mr. Amod Vijayvargiya, Director, Global Knowledge & Business Services, Capgemini shared with the students of SJMSOM, his experiences and opinion on the subject Enterprise 2.0 – user engagement and communication sharing. He insisted that the emerging changes in enterprises were about culture, and not about technology. 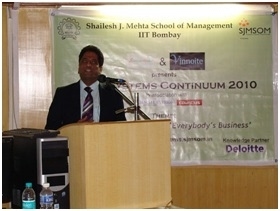 Mr. Sanjay Mehta, Jt. CEO, Social Wavelength discussed in depth what it takes to operate a successful digital business in India. He cited several examples of successful digital business models such as Google, naukri.com, eBay and so and also gave insights into the challenges faced by businesses in digital space in India. 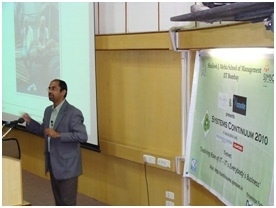 Dr. Vishwanath Poosala, Head of Bell Labs - India, Alcatel-Lucent, had the audience spellbound with the different information and communication technological advancements such as Nano Ganesh, Nokia lifetools that are influencing the rural India. He reiterated the fact that a large chunk of the rural market remains yet to be captured. Mr. Anshuman Chaudhary, Senior Manager, Cognizant Technology Solutions, spoke in depth about the e-governance and the role of software service providers in catering to these needs of the nation. The entire event was a grand success and the audience received large amount of knowledge as well as topics to ponder upon.